We were all made in God's image. I like to think of myself as an artist and since God is The Creator, I think of Him as The Artist. So why isn't there more exploration in the christian community into God-centered Creativity? I have this friend who came up with this idea, then bravely asked the artists she knew to collaborate and help her make it happen. I am so excited about the outcome of this collaboration. I am so honored to be a part of it. 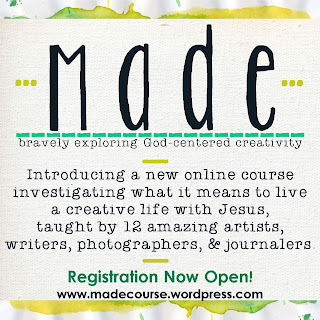 Made is a 4 month online course, taught by 12 amazing christian Artists. I am so honored to be teaching a few workshops myself (Making an Art Journal; Creative Healing; Interpreting the Word) but even more excited to learn from the other artists. It starts in September. Sign up now. Hi Megan! My name is Heather and I have a question about your blog! If you could email me at Lifesabanquet1(at)gmail(dot)com I would greatly appreciate it!